People most of the time ignore windows for bathroom areas just because they do not consider it a functional part like wall tiles and flooring. While selecting treatment for this unrecognised element of bathroom, several aspects come across our way like privacy, effective light, proper ventilation, moisture defiance and durability etc. Wooden Blinds: They are most common preference for bathroom windows because of their advantages like easy to clean, huge range of decor, and perfect light with perfect covering to view. These blinds are easy to install in all types of bathrooms. 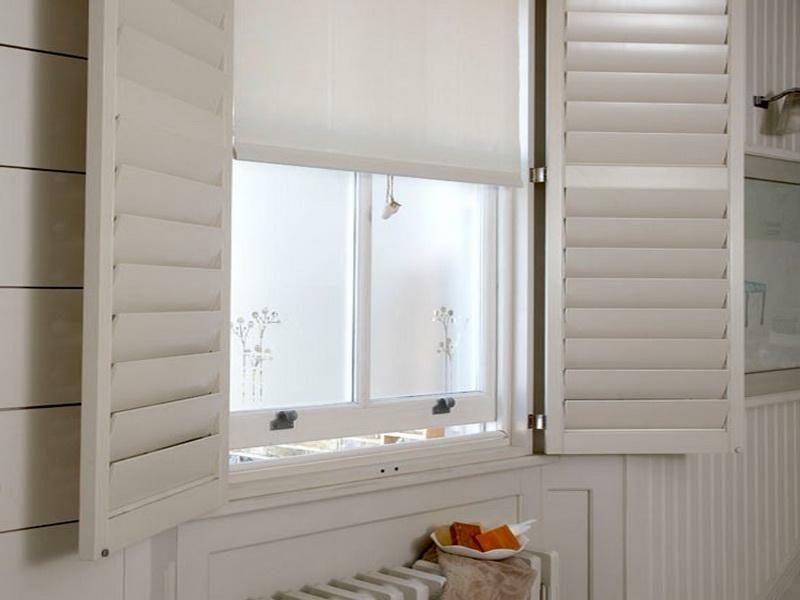 Interior Shutters: These are common choice in most of New England and British Bathrooms because of their classic look. These shutters improves privacy by covering bottom half of window perfectly and allow light from upper portion of window. Window Film: For bathroom window covers this option is inexpensive as compared to others and is available in various innovative design patterns. Glass Blocks: This choice gives your bathroom window a creative look with variable designs. Glass blocks add unseen beauty to windows with perfect light inlet and improve privacy too. Combining Shutters: To give modern look to your bathroom window, this option will be best with great flexibility. They can be easily opened and closed as per need with perfect light inlet. Cafe Curtains: These curtains are good to give stylish look to your bathroom with beautiful colour shades. Cafe curtains cover the lower portion of window to provide privacy whereas upper portion is left for light and views. All these window cover options may help you in selection of best arrangement for your house with perfect light and privacy. Windows add beauty to bathroom area but it is important to follow good designs so that they look an entertaining part of bathroom instead of an unrecognised element. Window treatment depends upon flooring and wall tile colours also because a perfect match will give your bathroom luxurious look. Most of the people pay specific attention to bathroom designing and they apply latest trends for bathroom fittings so that it looks graceful part of their home. Many interior decorators will provide you best solution for window treatment with affordable price range. Generally curtains are not considered good option for bathroom windows because they lead to humidity with a great demand of regular maintenance and cleaning. If you want to use curtains for bathroom windows then prefer for good fabrics like voile, muslin and lace etc because they will allow easy passage to light with fast drying capacity. On the other side shutters are preferred mostly due to their easy maintenance and operation. These covers are good for humidity control and allow perfect light to pass inside. Natural wood shutters and vinyl materials are mostly preferred for bathroom windows because they easily crack moist surroundings.